Well, I was trying to go three for three in the days to get out my writing about our vacation, but the weekend happened and I got a little lazy. But, here’s the recap from our last day. As I mentioned in my log of our first day, today was really only one thing, Alcatraz. It really worked out that way since our flight was that night and our tour ferry was at 12:15pm. So, we basically planned to spend the whole cday at the wharf and on Alcatraz. This was fine with me since the weather was the best of any of the days that we were going to be there, so why not spend it on the water? Again, our day began by taking the Muni to Fisherman’s Wharf. After we arrived, we needed some breakfast, we ended up eating at the most expensive Denny’s that I’ve ever been at. 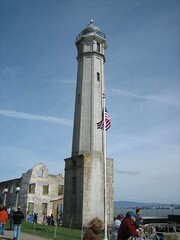 Next, we headed to the pier where our ferry would leave from and head over to Alcatraz. There, we ran into a family that we talked to while we were waiting in line. They were from the Midwest and they had just arrived to the city a day or two prior. So, it was nice to have some conversation while we waited in line. Eventually, we made it onto the Ferry and were off to the island. It is kind of strange to see it, much like it was with the Golden Gate Bridge. As you get closer you just look at it and can hardly imagine what it must have been like to be pinned up on an island. After we arrived at Alcatraz we grabbed our Spanish copy of the visitor’s guide and headed off (I had an English backup). We meandered our way up the island to the prison and began the cell block tour. I’ve never been in a federal penitentiary, nor do I plan do, but it is like you’d expect. Lots of cells and restrictions everywhere. It was pretty amazing to actually see it. The cell house tour is worth it and I don’t think I would have enjoyed it as much if I didn’t have the audio. So, if you do visit, spend the extra couple of bucks and get the audio tour, it’s worth it. When the audio tour was finished, Jamie made her requisite stop into the gift shop and I headed outside to take some pictures. You get some pretty amazing views of the city and the bay from the island and it wasn’t an opportunity that I was planning to pass up. So, I snapped up some pictures, took a panorama of the bay, and Jamie and I got some shots of us being tourists (minus my Asian peace sign). Looking at the time and realizing that there wasn’t much else left on the island for us to see, we hauled our butts down to the ferry dock and made our way back to shore. When we got back we wandered around Fisherman’s Wharf some more and then we made our way down to Ghirardelli Square to see that before we made our way back to the hotel. Jamie went to get in line for a shake, which ended up being a fudge sundae. I just sat and waited by the fountain and secured us a seat on the bench and listed to some Jazz saxophone player play for the entire time while I waited. So, the time went by pretty fast. When Jamie got back we enjoyed the dessert that she had purchased, and it was pretty good. I haven’t had a chocolate sundae in a while and it was a nice treat. So, that marked off another thing on our to do list. Seeing that we were going right to the airport from the hotel we decided to check out In-n-Out burger before we got on the bus back into downtown. The line wasn’t too long, but the place was pretty popular. We got a little bit more food than we could eat, but what we did get was good. The burgers are tasty, but I guess I was expecting a little more. Not that I was disappointed, but people always talk about how they want an In-n-Out burger and how amazing they are. I thought they were pretty fancy for fast food, but nothing orgasmic. So, that leaves us taking the bus back to the hotel, getting our bags, boarding the BART to SFO and catching our flight. As some of you probably already know, we got bumped to the next day. It worked out fine for us and United took good care of us. We got $44 in food vouchers, a night stay in a hotel that was nicer than the one we paid for, free breakfast at the hotel, and a round trip ticket to use in the lower 48 states in the next year. 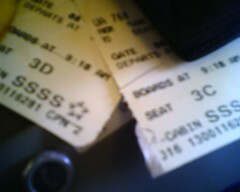 On top of that, they bumped us up into first class for the flight back to Seattle. So, pretty sweet deal if you ask me. All in all, I was at work only four hours later than usual, which I made up later that week. Not a bad trade off, if you ask me. Overall, the trip was fun, I’d go back… when the weather is nicer. I’ve seen the city in the wet, but I’d like to enjoy it in the sun too. It was also a pretty jam packed weekend, we saw a lot, did a lot, ate a lot, and had a bunch of fun. So, I’m glad that we went, if only for three days. Next Next post: Alma Mater… what?